I think all four of us would agree that this month was the hardest round to do. I know mine was on my design wall the entire time, puzzling me. Cindy had put a wonderful spin on Julie's centre block, literally, and I wanted to keep that feeling. I knew I wanted to tilt it somehow. Putting it on point didn't look right, most likely because those angles conflicted with the HRTs. So I knew I wanted to incorporate half-rectangle triangles, aka HRTs. FaceTiming with Tish tonight made me realize that I should've put a before photo in, so you see what I started with. Here is the block I received from Cindy. I used strips of white Moda Grunge left over from Aidan's quilt, Radiance, to put a box frame around it, and then used random strips laying around to mark off the possible angles I had in mind. I could see a white square floating behind the coloured fabrics in Cindy's round; was there a way I could play off that? Enter math. And Mini Round Robin rules that we'd set out at the beginning, one of which was only being allowed to add a maxium of 6" finished to a round. So these HRTs had to be mighty skinny. 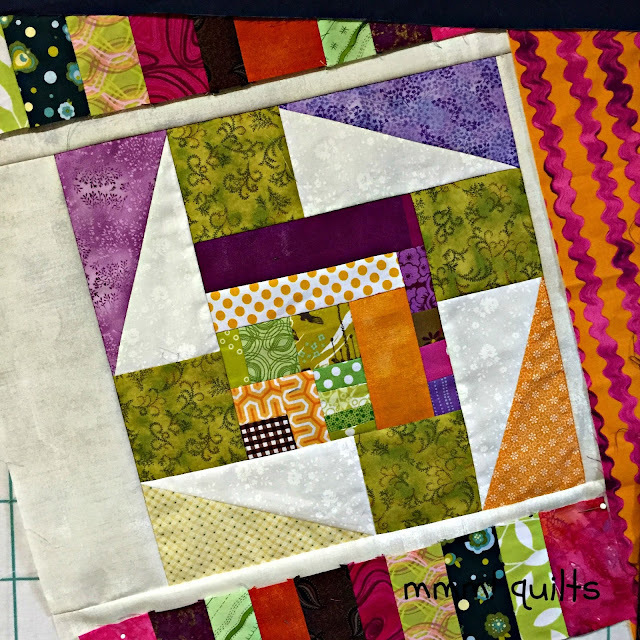 I pulled various fabrics in keeping with Julie's oranges, purples, one pink, and yellow-greens, although there are some almost-mint greens in as well, and that rich brownish-berry checkered start to her offset improv log cabin. Improv! That was when I knew I needed to add improv to this round and stripes. Yikes. That worried me a bit. Improv I've done, but not a lot. The rick rack fabric was just to mimic a stripe; at this point I hadn't made all four of the improv striped rectangles. The idea of angling of the Grunge as the HRT and then adding the stripes was the one that really did appeal to me in the end. (drawn in pink) Which was this morning, btw...a busy weekend with time out of the house meant I didn't have the sewing time I needed when it came down to the wire. I put cornerstones in the four corners instead of carrying the stripe to the edges. 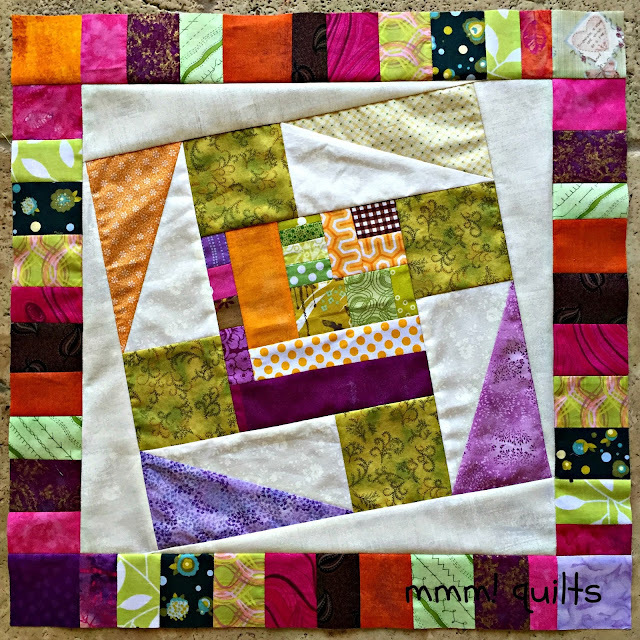 I originally had thought to do all four a green to echo Cindy's squares that tumble, but couldn't find a good one, or not enough OF a good one. So I did four different ones, and matched them to the colours in Cindy's HRTs! 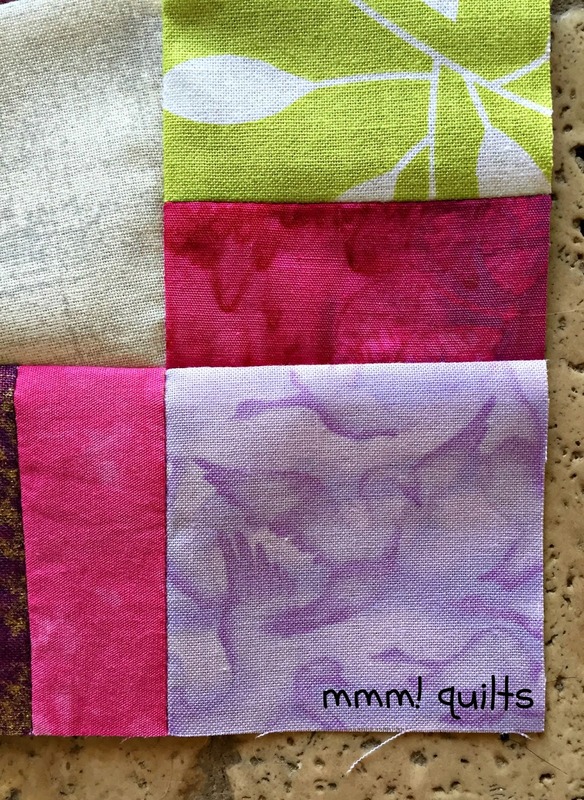 This one, left over from a good friend's baby quilt I made, says swans on the selvage, but I always think geese. As in Canada. 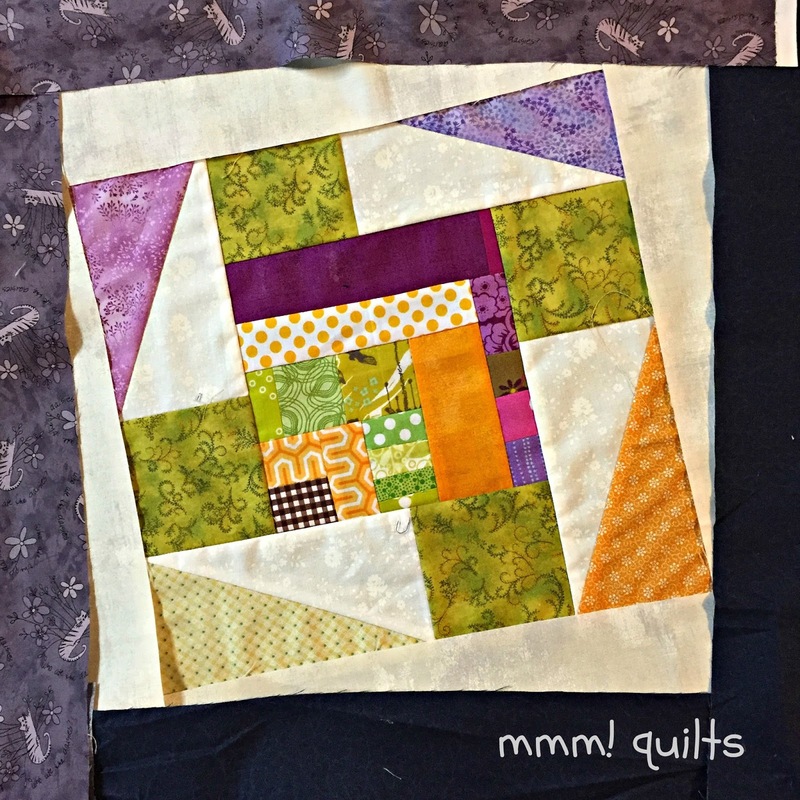 The other purple corner is a chunk of Moda Marble Ombre Dots from Dayna's grad quilt. 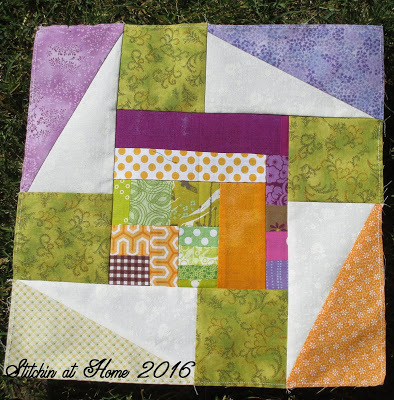 I was with Julie last summer when I found the perfect purple to use in the final border of Dayna's quilt; I chose not to use a piece of it here because I wanted a richer purple to pull in the Grunge purple from her centre. The fourth corner, the brilliant orange, is another chunk left over from Aidan's quilt, fittingly called Concrete...Rock Solid. Let's just say Julie's family knows their concrete! I'm sending it off to Tish tomorrow for her to do her magic on the final round. This has been SO MUCH fun and even though it was such hard work and lots of agonizing this month, it is good to push oneself and to build on others' work; thus we grow. Of course doing this with such good friends makes it that much better. I like how you turned the block and the addition of the improv strips. It builds so well on what Julie started with. Well done!! Great job!! I'm doing a round robin as well but am stumped. Might send you a photo for some suggestions. Oh so colourful and beautiful! I love how your round contrasts the the angles of the previous, well done! And I like that the fabrics are special! Fantastic, love that border so much, with those colours it glows. Love what you have done here. Turning the block was a fantastic move. Wonderful that you included those special fabrics. 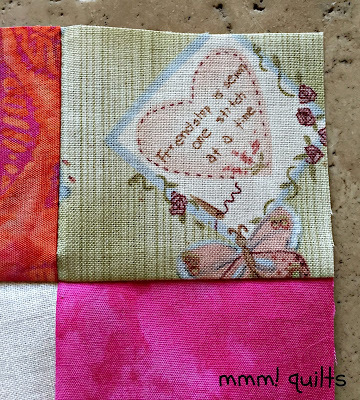 I am loving all four quilts in your Round Robin. This is great! 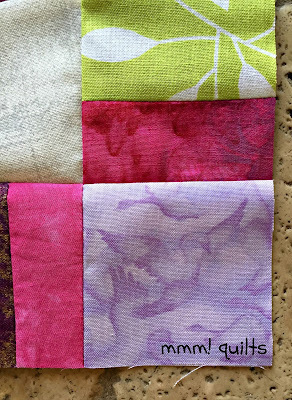 I have really enjoyed seeing these 4 quilts being made over the last couple of months. Great to read how you went about the process. I have joined a travelling bee for the first time recently and have just sent off my initial block. Very excited! This is a hot mess and I don't know where to look. Like I walked into a party and everywhere I see there are long-lost friends and I don't know whom to hug first :-D Loveliness in every round!!! I am so glad I sat this one out. 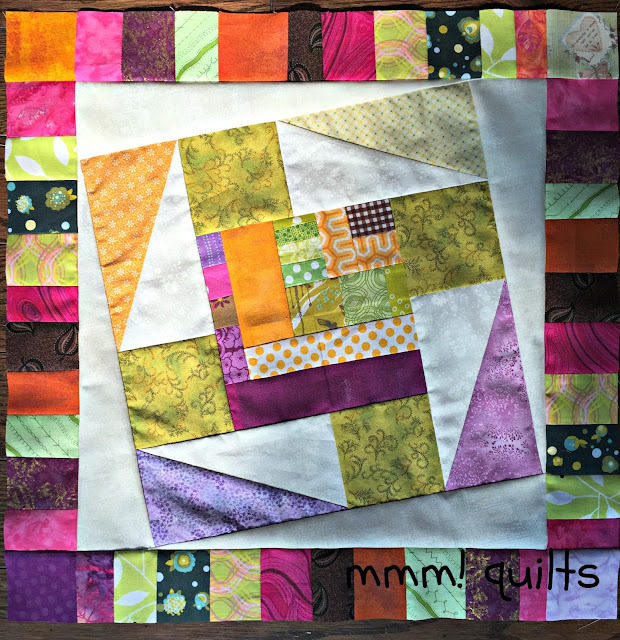 You are just too fast - lean, mean quilting machines - all of you. The continual spin of the borders really makes the quilt seem like it is drawing me in as I look at it. I like how the lighter grunge is a bit of a visual rest, too. You all did an amazing job with this round! That seems like a lot of fun play. It looks wonderful in the end, after all that sketching and thinking and auditioning. I LOVE what you have done with Julie's block. I find myself really scratching my head, how do I possibly add to this, it looks perfect. This block is turning out amazing! It is balanced so well. Great Job! 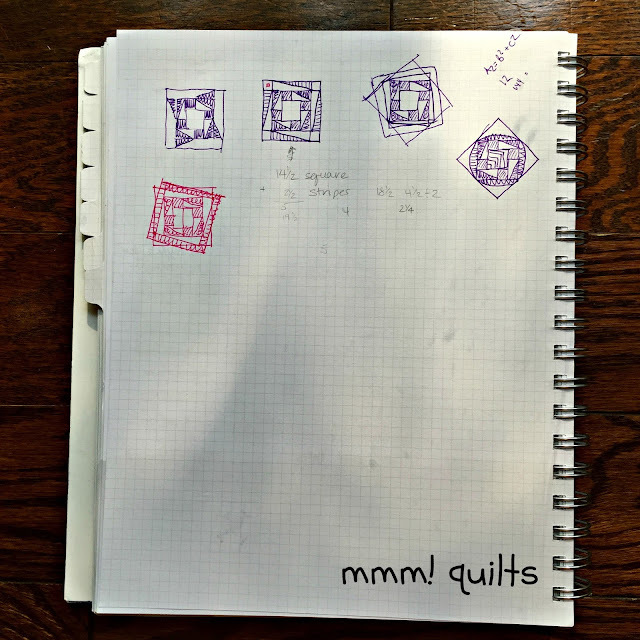 I love the idea of a round robin, I haven't done one myself, but reading about this process really makes me want to give it a go one of these days. You really added something special for this round! Your addition is so perfect! I am amazed at how wonderful all the rounds are on all the blocks. You ladies are doing outstanding work! Thanks for sharing on MCM! It had not occurred to me how much pressure there would be in each round to make it look great. Well you surely did this round justice Sandra. 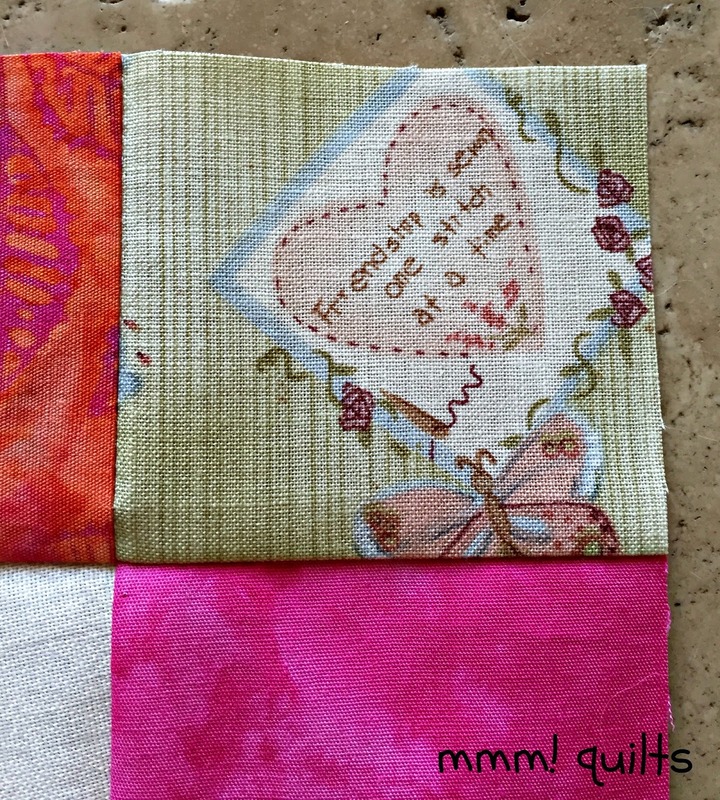 The twist is a really great effect and the fabrics are just scrumptious!